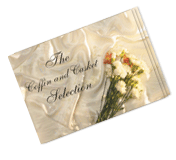 The coffins and caskets shown are manufactured by one of the Country’s leading and long established companies, using skilled craftsmen and traditional manufacturing techniques. All products featured are manufactured from managed sustained yield forests where management and replanting are government supervised. Colours and models can be combined to meet individual requirements and most models are suitable for both burial or cremation purposes. However, some models may require a change of furniture in order to comply with cremation authority regulations. On this page we show just a small selection. If you wish to view the entire range we have included a download link (above), for the full Brochure in PDF format.